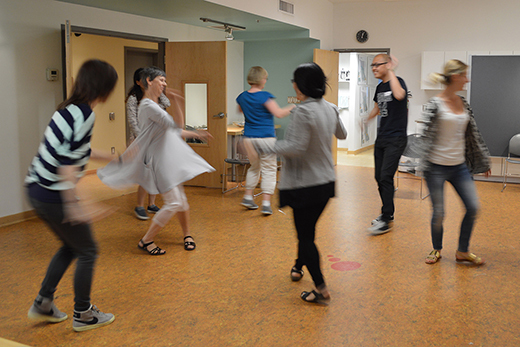 This month we enjoyed an engaging Art Fundamentals workshop with dancer, choreographer and Expressive Arts Therapist Lee Kwidzinski entitled Education in Motion: Introducing Creative Movement into the Classroom. 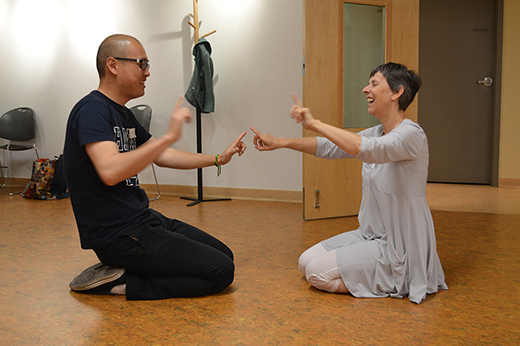 Lee initiated the session by introducing her interesting trajectory and therapeutic practice, where she approaches dance as an accessible and inclusive art form. She has worked with kids with special needs, kids suffering from dementia and has experienced first hand how engaging through movement welcomes kids of all ability levels to modern dance, making them feel successful. She also talked about her most recent experience as an artist in residency at Edwin S. Richards (ESR) Elementary in Mission, BC. Evidence of this residency project, called Adopt the Sea: Kiigad Gay.Ywaay, was showcased at the ArtStarts Gallery during the past Dwellings exhibition. "When children embody who they are, that's when learning begins and when the discussion begins. Movement is natural to kids, it comes before language and their imagination is involved," affirmed Lee as she described how students at ESR became sea turtles, fish and anemones, and explored marine biology through kinesthetic ways of learning. 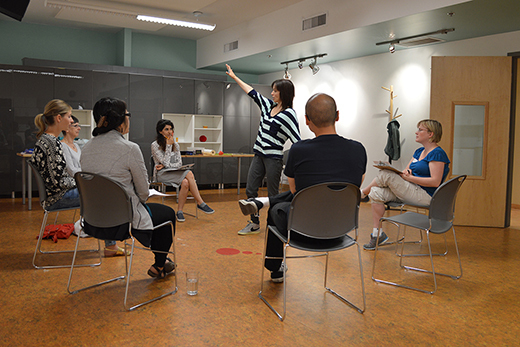 The group moved to the ArtStarts Lab space to continue with the movement component of the workshop. Lee prepared multiple props and introduced a wide array of activities that presented concrete and engaging examples of arts integration. The artist shared her magic toolbox, including movement and theatre based activities — like "I Like, See and Be Seen" and "Me at School, Me at Home" — that warm up the imagination. "The goal of this type of activity is to warm up the imagination so kids don't have to think, they have to instantly react," Lee explained. Participants were able to explore Math concepts such as addition, subtraction, multiplication, counting in 5s and 10s, symmetry and more, with their own bodies individually and also as a collective. The artist also shared how students can learn about colours through movement and understand different tones by asking themselves questions like: what does red looking like?, what does it taste like?, what does it feel like? Lee highlighted the importance of starting to answer these questions with physical responses that would then lead to students' visual arts experimentation. 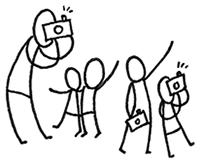 This approach would make a huge difference in their learning and also in the visual pieces they would create. Engaging in dance can be scary for some people, but Lee modeled as a movement facilitator how her objective is to nourish kids' imagination, focusing on the process and not in the final product. "Trust the process and the final product will come!," Lee encouraged, as she emphasized the importance of not worrying about a polished piece to be presented to a broader audience. "The job of the facilitator is to hold the space so kids can feel supported with the work they are doing," she added. Kids are in charge of the creation and the end product of a process like this is not what people would see at a dance show in a theatre. Parents can build empathy with this approach to teaching once they start seeing evidence of learning through these valuable arts integrated experiences. 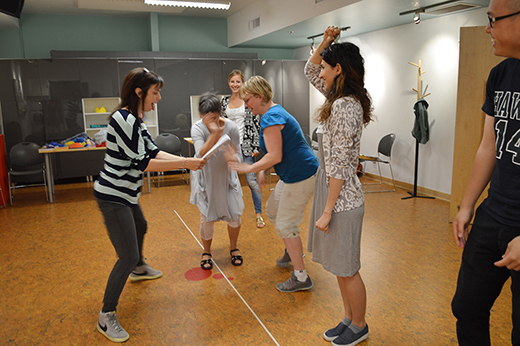 One of the exercises that clearly demonstrated an arts integrated approach to teaching was a group embodiment of the science behind sound and how humans perceive it. Each participant was given a role to play and was aligned in the space following the order of the events: vibration, outside ear, ear drum, bones in the middle ear, liquid, hair and, finally, the brain. 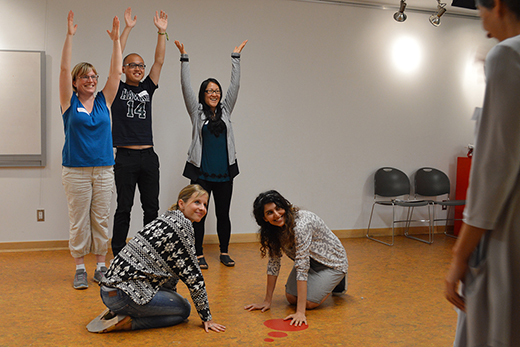 Each participant made a sequential movement to show how sound travels across the ear and then it goes into the brain. This activity was not only fun, it also provided a vivid understanding of these concepts. Finally, the group brainstormed on possible ways to teach about the solar system with the intention to show — without words — the scientific concepts behind this unit. Each participant came up with very interesting ideas! Participants ended the session with an expanded understanding as well as many practical examples that they can bring into their own classrooms. "This workshop was exactly what I needed to get ideas for active lessons that get students moving." "Teaching doesn’t have to be all lectures and worksheets." "Lee is an awesome facilitator and I wanted to see her in action again." 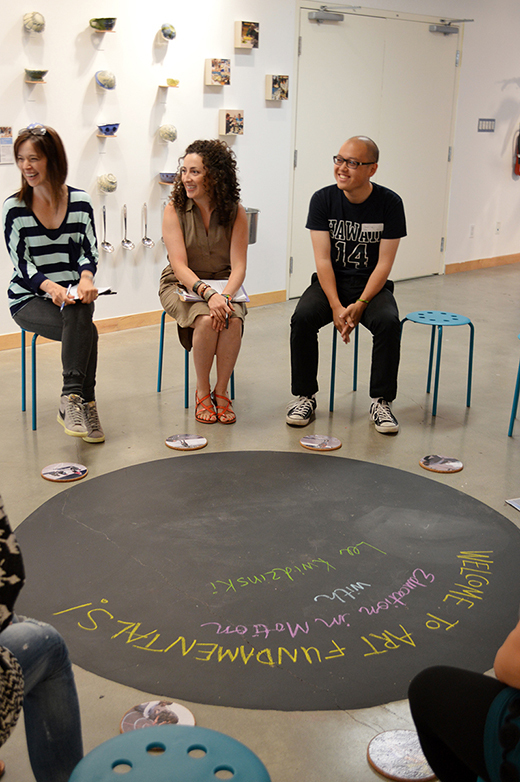 "Loved the facilitator — she is super inclusive, welcoming and has a soft easy demeanor." "I was able to think outside the box to really make learning come alive." "I got many amazing lesson ideas." 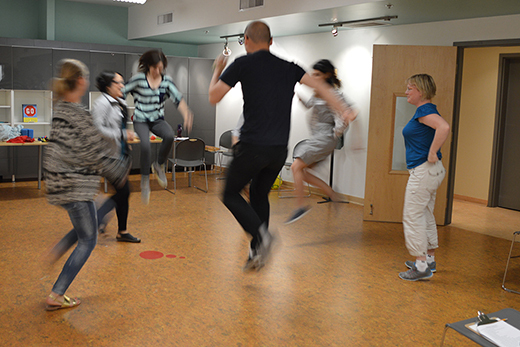 "I discovered how accessible movement is — doable, fun and very powerful as a learning mode." Thanks to Lee for sharing how to activate learning in exciting ways and how to bring the curriculum alive through the arts!